I finally know my way around. During the month of November, I’m participating in NaBloPoMo, where I try to write and publish each day. Often, I’ll be writing to a prompt – like today. My husband is great at finding his way around. We can be in a neighborhood he’s never been in, winding through stop signs, turns, and houses that all look the same, and he can find his way out without any problem. He’s got a great sense of direction, and often looks at the car’s compass (in his car, it’s just a lit-up letter on the rearview mirror) to decide whether to go left or right. Me? Not so much. It took me several years of living in my town to start knowing my way around. When I moved here, for college, there weren’t phones with GPS, and so I had to rely on friends’ directions just to get to the nearest grocery store, the movie theatre, or a restaurant. I was using the highway to get around town almost exclusively for years, not knowing other ways, whether they were shorter or easier, or not. But somewhere amid moving into the house we live in now, and attending work trainings at different schools in the area (back in my teaching days) I finally got to know some new neighborhoods, lots of good shortcuts, and the best way to use our main thoroughfares. I can cut through my neighborhood on any single street and get to where I’m going – and that is quite an accomplishment for me! You see, this city felt like home even before I knew how to navigate it. I loved my college campus. I had, and still have, great friends, including many who grew up here, and some who, like me, came here for school and decided to stay. It’s a warm and welcoming town, lots of opportunities to meet new people, join local organizations, or find cool events that are happening all the time. It’s not too big, in case you get overwhelmed in huge cities full of skyscrapers. But it’s not too small, either, for those of us that think that tiny towns have a little too much familiarity. It’s a good size, particularly when you need to run an errand on one side of town, and one on the other… you can do it within a reasonable amount of time. Finally learning my way around – well – seemed like the final piece of the puzzle toward becoming a “local”. Now that I’ve been here for 13 years, I definitely consider myself an expert navigator, directions-giver, or even shortcut creator. And when I go back to the town I grew up in, a smaller town with less big highways, I feel like the newcomer. I’ve forgotten the shortest distance between two points, or I can’t remember street names that I have aways known. It seems I’ve only got memory space enough for one town’s road map. During the month of November, I’ll be participating in National Blog Post Month, where I’ll publish a post every single day. Sometimes, like today, I’ll use prompts. This one I wrote in about five minutes. Today’s prompt: What are the most meaningful relationships in your life? If you truly ask me to choose a most meaningful relationship, or the top 5, perhaps… I don’t think I could honestly do it. My no-brainer answer seems to be my husband. He’s the one that I know I’m stuck with (HAPPILY!) for the rest of my life, and come what may, he’ll be my person until we cross over into heaven – for which I am so grateful. He is amazing; he’s good to me, knows me well and loves me anyway. What more can I ask for? But when thinking of other relationships that I’d put up there with my marriage, it starts to blur. I have three kids. I can’t very well prioritize one of those relationships with my other kids, right? I also have a Savior, who, admittedly, should’ve been the first relationship I mentioned, since that’s what He calls us to: relationship with Him. Reliance on Him. Love for Him. That should be my most meaningful… and it is, truly. It’s through my relationship with Him that I am given the ability to love, and the very love that I freely give to everyone else with whom I’m in relationship. But after my familial unit relationships, I put great importance on my relationship with my original family unit: my parents and my brother. And grandparents, aunts and uncles with whom I grew up being close with my entire life, until I did “leave and cleave” to another family unit – whose relationships I also greatly value! And don’t even get me started on our close friends, their kids, our pastors, community group, co-workers at church, co-heirs and co-laborers in Christ’s Church! They are all of great importance to me. There are things to share with each other (not least of which is just sharing life together!) that I could just miss out on if I wasn’t willing and able to put myself in relationship with so many wonderful people. So I suppose my real answer for the prompt is, well, all of them. All of my relationships are meaningful. Even if they don’t seem overly meaningful to me at this exact moment, they could be to the other person. And just that fact makes me value them a little more. Those people close to me, whom I see and talk to and do life with, those are my most meaningful relationships. Those are the relationships, all 30 or 40 of them, that I value the most, that I make the effort to develop, and that I would be horribly sad to see ended. Today’s prompt: Do you write in cursive? I journal. Sometimes, I journal a lot, pages and pages at a time. Sometimes, there are weeks between the times I’m truly able to sit down and pour myself out. I don’t usually write about things that happened that day, or grocery lists for the next trip to the store, or my thoughts on the latest movie that came out. It’s not a 16-year-old’s diary, right? Sometimes, the pages are full of prayers, pleas to the Lord for one thing or another, one friend or family member who needs a touch from Him. Other times, I’m processing something that’s happened, something I’ve read, or something I heard on a podcast or in a sermon. But one thing has been consistent in my journals for years. I can look back at journals from college (now ten years ago) and immediately recognize my handwriting as if I’d just written on those pages yesterday. Typically, my heart-outpouring scrawl is a mostly cursive, quickly slurred jumble of letters that is readable, but may require some deciphering. I frequently leave out a letter in the blend of loops that is a longer word. I also slur words together, as if I’m dictating someone who’s had to much too drink. I also have a couple of letters I rarely write in proper cursive style (s’s, for example, and uppercase G’s). I’ll stop a word right in the middle to write an “s” in “print” instead of writing it in cursive. I think the way this handwriting evolved was when I got to college, and needed to write a lot very quickly. When I took notes in high school, my writing varied depending on my mood – sometimes a lovely cursive, sometimes all caps (something I’d seen my mom do on grocery lists and such), and sometimes a neat and tidy print. But those things mostly happened when I had extra time, and wasn’t in a rush. My slippery cursive-print blend evolved from my necessity to get information (or feelings) onto the paper before the ideas fell out of my head again. I still love writing, or even just doodling my name, particularly with a fancy pen. And, by the way, fancy pen for me doesn’t constitute something like a fountain pen. It really just means one that doesn’t blot, might be a lovely color of blue, and won’t smear onto the side of my hand. Because I’m left-handed. I know you’ve seen someone with lead or ink smeared on the outside pad of their left hand before… right? I used to hate coloring with markers because I couldn’t keep my hand from getting covered in ink. My OCD goes way back to my early childhood days, trying not to be messy. And I still don’t like it. While I’ve been doing this NaBloPoMo, it’s been interesting to see what I have to write about. I decided for the last day in November, I’d write forty things I was thankful for. So here they are. 1. The roof over my head. A roof that is also known to be atop a hospitable place, known at least for good food and friendly faces, if not insurmountable messes. 2. The clothes on my back. I am always dressed in clothes without holes, appropriate for the weather, and typically at least a little bit stylish. I can be grateful for each of those things, and the incredible blessing that is all three. 3. My little big girl. At four and a half, EK challenges me every single day to be a better mama, have more patience, and pray about everything. I can see that my strong-willed daughter will be much like I was growing up, and I must prepare my heart for what is to come. But I am also immeasurably grateful for her heart, her energy, her intelligence, and her defiance, because they make her who she is. And who she is is wonderful. 4. My marvelous middle child. Even at not quite three, I can see J’s sweetness and gentle heart blessing others. While he certainly has his moments (I mentioned he was two, right? ), he is generally thoughtful and kind. I don’t know how he does it, when the dominating females in his life have little patience (I mentioned EK and I are the same, right?) but he lives with us well. Just like his daddy. 5. My miraculous baby boy D. Spending a month not knowing whether you would live to see us or not was the scariest thing I have ever done, and I will be forever thankful for your healthy, joyous self. So full of smiles and giggles, you are the sunshine of our lives. 6. My kind and talented Hubby. He loves me unconditionally, and is a true saint in the way he treats me and puts up with my messy heart. He is patient with me when I am at my worst. He is an incredible father to our children, and I look up to him in every possible way. 7. The sheer number of good friends we have in our town. We have countless friends, new and old, that we love to hang out with, and that we could depend on in a time of need. 8. My church family. I really, really do consider myself blessed (#blessed, y’all) with a huge group of people who do life alongside me, who encourage me, teach me, push me, challenge me, and celebrate with me. 9. My women’s small group. These women are fun, insightful, encouraging, and genuine. We often have deep discussions, but we also enjoy hanging out together. Those are both so important, and I’m thankful for them and their discipleship alongside me. 10. My community group. These families are kind, funny, loving and helpful. We get together a couple of times a month, but I always find myself wishing we hung out more often. 11. The Bible. I know it sounds a little cliche for a Christian to say they’re thankful for the Bible, but I really am grateful for the comfort, encouragement, and conviction it provides. 12. My jobs. Sometimes I feel overwhelmed at the loosey-goosey, different-every-day nature of my jobs, and I often remember to do something or attend a meeting at the last minute. But these jobs allow me to spend an immense amount of time with my children and my husband. I am very grateful for that. 13. Food on the table. In the fridge. In the pantry. In my belly. Many people in this world – a staggering percentage – do not have enough of this basic thing of which I have an abundance. 14. Clean water. So many places do not have this luxury that we as Americans take completely for granted! 15. Sunshine. It is healing. I know, I know… it also could get you burned, but I think just knowing it’s right outside the window can make you feel better than a rainy, dreary climate. 16. Coffee. That precious, delicious treat that borders on necessity. Whether I make it, Hubby makes it, or the local barista makes it, I do so love it. 17. Wine. That deep red, or that bubbly… it’s a perfect addition to dinner or a snuggle on the couch watching TV. It’s certainly not a necessity, but it sure is a nice treat. 18. My family. For this one, I mean the dynamic between the five people that live in my house. We love each other and play well together. Sometimes we fight and get on each others’ nerves, but that won’t really go away. We work through it and move on. We love being together and for that I’m thankful. 19. My family. Like, the extended, everyone’s included family. I’ve got the best parents, brother, grandmother, and more I could ever ask for. They might live far away, but I love to see them! 20. My in-laws. You guys, I really hit the jackpot with in-laws. It’s a HUGE family, and I love every single person in it. I’ve got cousins, aunts, and uncles galore now, and also three more brothers, three sisters, and adorable nieces and nephews. I win on the family thing. 21. Music. It makes me feel all the feels. It relaxes me. It allows me to be in community with others in a special way. 22. Running and exercise. This is huge for me, since I use it as a stress reliever. I like being healthy enough to go on a run, blow of some steam, and sweat the feelings out. 23. Leggings and boots. They cover a multitude of sins (like not really wanting to be dressed, and feeling fat). 24. My health. I might not be the healthiest person in the world, by choice or genes, but I am far from unhealthy. I exercise, eat fairly healthy, and have been blessed with little sickness or other issues in my life. I’m thankful for that! 25. My car. I am blessed to be able to get from point A to point B with three children in tow. I can’t imagine how difficult it would be to use public transportation with three kids under 5! 26. The right to vote. And to take birth control. And to drive, to stand up for myself, to work, to not work, to make money, to spend money, to be a person who can have any life I want. Women have come a long way. I’m particularly thankful for the right to vote this year, when it seems to have mattered a little bit more. 27. Technology. It’s proven to be dangerous sometimes, and when used incorrectly it can be awful. But it’s nice to be able to do things like check the weather, talk to friends, take pictures, and look up recipes all on my phone. 28. Heat. I’m particularly thankful for this one at this time of year, when it finally has gotten cold here. I’m thankful I don’t have to be chilly at night. 29. Gifts. The fact that we are able to buy gifts for our family and friends without worrying about what we gave up. 30. Humor. We love bent funny in our family. All things silliness are a blessing to me. 31. My love of reading. I truly do love getting lost in a book. It’s an enjoyable activity for me, and has been all my life. I hope I can pass it along to my kids! 32. Books. In addition to my love of reading, I suppose I should be thankful for what I read. I have learned so many things, been transported so many places, and felt so many emotions (all the feels!) due to the books I’ve read. 33. Sunshine. What a mood lifter! I never tire of seeing the sun. 34. God’s glorious creation. He has crafted each colored leaf, each ocean wave, each mountain’s peak, and ray of sunshine into a perfect masterpiece. 35. Modern medicine. I am thankful for vaccines and medicines that keep my family healthy, and the access I have to pretty much whatever we need. 36. The fact my kids are siblings. I love that they’re learning to share, love, give, and solve problems alongside each other. They are fiercely loyal to each other and rude to each other all at the same time. Perfect. 37. The holidays. I love seeing my family, Hubby’s family, lots of friends, and my kids all together. 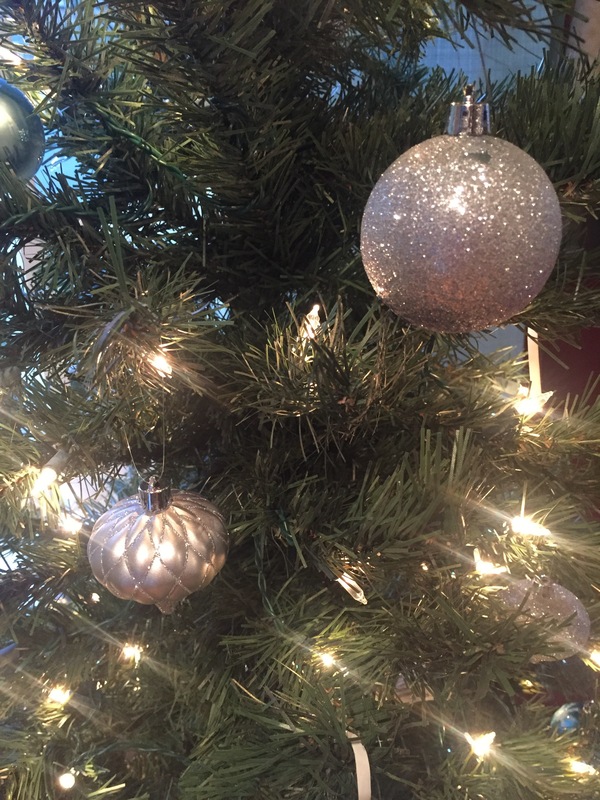 I love celebrating (no matter the reason) and I love all the sparkles and lights this time of year. I love sharing the wonder with my children, and helping them learn about why we celebrate Thanksgiving and Christmas (and other holidays as well). It’s such a warm and fuzzy time of year right now! 38. Dessert. Specifically cookies. My favorite. I don’t need to explain myself. 39. The rain. What a cleansing and healing thing for the earth, and often for my soul. Especially thankful for it in the mountains right this moment. 40. My town. Y’all, I love Winston Salem. I love this community, the diversity, the cool spots and nice places, the parks and playgrounds, the shopping, the eating, the beauty of a perfectly sized downtown. I just love it. Oh, how the first Sunday of advent prepares my heart for Christmas. Today is a day of celebrating, and also a day of being intentional about turning our hearts to the manger to await the coming of our King. To turn my heart away from decorations and gift-buying can sometimes be hard. Often, getting caught up in Black Friday sales and locating the perfect decor for the unfestive corner of my home take precedence after Thanksgiving. Because t this morning, my pastor likened Thanksgiving and Christmas to s kind of homecoming. We typically gather with our families or even travel to our (former? forever?) homes to be with those we love. He nudged us to apply this sense of “homecoming” to the Christian life. A homecoming not for physical things, but coming home to the eternal love of a Father, the spirit of loving, giving no and worshiping a King who has sacrificed everything to bring us home. We are reminded as Christians, especially during the Christmas and Easter seasons that we are only in a temporary home. This world is not our forever home, and we should never forget that. The home we look forward to joining is the perfect place to spend eternity, together with the saints and our Jesus in heaven. We have been adopted into the most prestigious, loving and healthy family there is, assigning us to a feast table beyond our wildest imaginations. We are accepted and loved and made whole in this familial identity. We have indeed found our worth in the sacrifice that was made on our behalf. So as you enter Advent, turning your heart to the manger, don’t forget that the manger leads to the cross. We are on this journey together, pointing to the same destination in a few months’ time. This anticipation of the arrival of our King leads to His death, but also His resurrection, the mind-blowing realization that He has done the work to keep us His and whole and bring us home.